Weatherdek has been supplying quality vinyl decking products for over 35 years. We’ve been around through multiple warranty cycles with proven products. This is why Weatherdek is proud to offer our customers up to 5 year Appearance and 15 year Waterproofing Warranty. Weatherdek and our Authorised Weatherdek Dealer / Installers stand behind our products and workmanship with comprehensive written warranties. As the manufacturer of the Weatherdek products, ADS Weatherdek warrants our membranes against manufacturing to be waterproof for the term of the warranty. 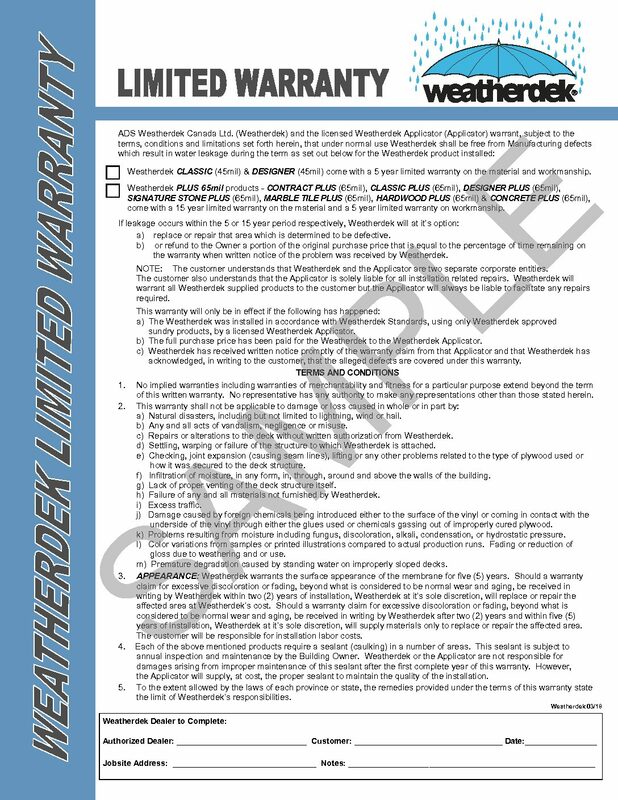 Weatherdek also provides an appearance warranty on all of our membrane products per the terms of our written warranty. Your Authorized Weatherdek Dealer warrants their workmanship and installation of the Weatherdek products giving you complete peace of mind that ‘ We’ve got you covered’.